Rabbi of Rome in the sixteenth century. In a decision of 1539 his signature reads "Michael b. Shabbethai ," the last word being the name of a place in Africa whence probably Michael's ancestors originated, and becoming when Latinized "Zematus." 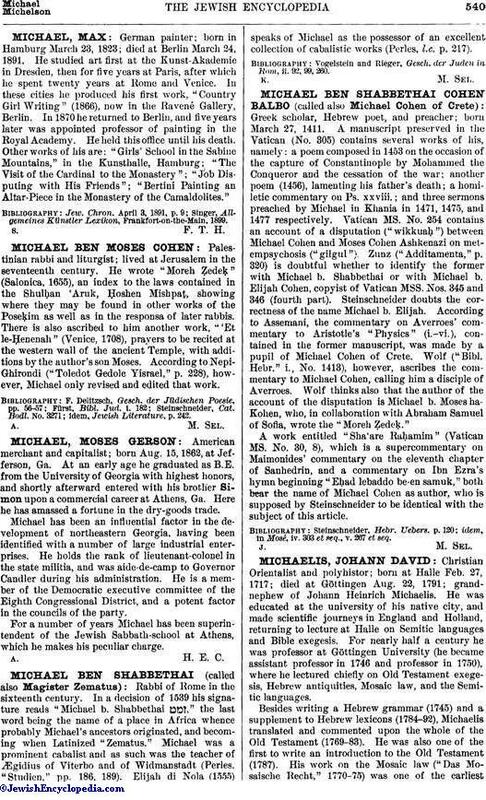 Michael was a prominent cabalist and as such was the teacher of Ægidius of Viterbo and of Widmanstadt (Perles, "Studien," pp. 186, 189). Elijah di Nola (1555) speaks of Michael as the possessor of an excellent collection of cabalistic works (Perles, l.c. p. 217). Vogelstein and Rieger, Gesch. der Juden in Rom, ii. 92, 99, 260.